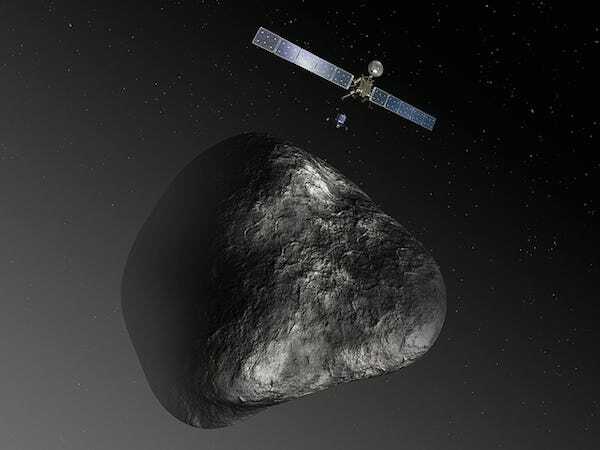 European Space AgencyOn Nov. 12, ESA will attempt to land on a comet for the first time in history. Of all space missions in history, the most difficult kind is, without question, landing a space probe on an extraterrestrial surface, like the moon, Mars, and Venus. Even more difficult? Landing on the surface of a tiny, spinning, rocky comet. Humans have never landed on a comet before, but the European Space Agency hopes to on Nov. 12 in what might be the hardest space mission ever attempted. 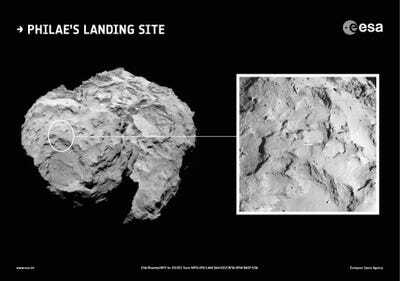 That day, the ESA Rosetta spacecraft will deploy the Philae lander in an attempt to make history. If the mission is successful, this comet will be only the seventh celestial body on which the human race has ever landed. So far, we’ve landed on the moon, Mars, Venus, Saturn’s moon Titan, and two asteroids. But none of these compare to landing on a comet. The comet will be travelling 40 times faster than a speeding bullet. Spinning on it’s axis once every 12 hours. And all the while shooting jets of gas out of it’s rocky and uneven surface. Not very welcoming! Nonetheless, Philae will brave this uninviting surface and risk it all as it homes in on its small landing point, called Agilkia, on the head of the comet, shown below. To make things more terrifyingly heart-pounding, no scientist will be steering the lander as it descends. Step 1: The Rosetta Spacecraft will descend to 13.6 miles above the comet. European Space AgencyArtist’s conception of the Rosetta spcaecraft deploying the Philae lander. Step 2: At that point, Rosetta will deploy Philae, which will use the navigational system scientists installed on it 10 years ago, to find its way to the spinning, jet-spewing comet surface. ScienceAtNASAAnimation of Philae navigating its way to the comet surface. Step 3: Philae will slowly descend to the surface. If everything goes according to plan, this decent will take seven, nerve-racking hours. When it reaches the surface, Philae will drill itself three feet to the comet, securing itself for the long haul. If the surface is covered with loose dust, this could be a problem.